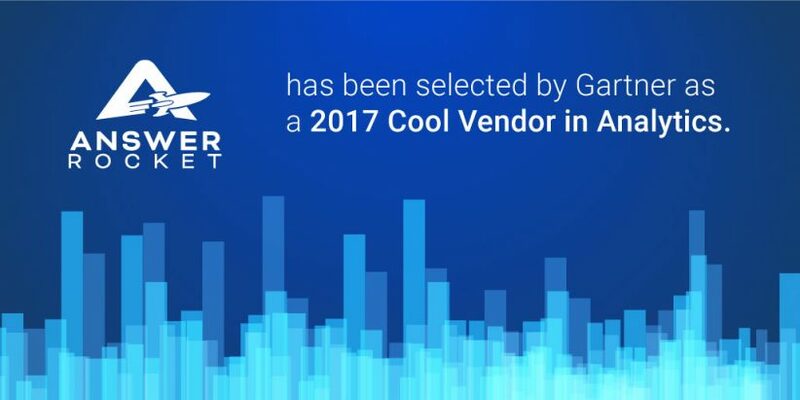 I’m thrilled that Gartner recently named AnswerRocket a Cool Vendor in Analytics. To be recognized by a worldwide leader in business technology research and consulting validates the hard work of our team and the support of our customers. But I was also intrigued why Gartner recognizes Cool Vendors. I love the association – but I wondered why the Gartner analysts landed on that particular adjective. Analytics software has been around for decades. The problem is that these software packages were designed for technical analysts who write SQL and understand database schemas. In today’s data-driven business environment, these specialists can no longer keep up with the data and analytics needs of business users. Many of these traditional BI solutions tried to solve this by extending their reach from technical specialists to business users – but these tools are just too complex. AnswerRocket was built from the ground up as a self-service analytics tool for non-technical business users. This was the persona we focus on, versus more technical users who are comfortable handling raw data. We provide an interface they use every day: a search box that accepts natural language questions and returns answers in seconds. That’s pretty innovative – but we aren’t stopping there. Our Smart Briefing gives an executive-level view of your business with automatically generated charts and natural-language-generated insights. This leaps past the KPI dashboards of today, by alerting business leaders to trends in their data, identifying outliers, and reporting progress against goals in easy-to-digest articles generated by the system. One of the best parts of my job is hearing about the positive difference we’re making for our customers. AnswerRocket delivers significant bottom-line impact – in fact, some of our customers experience an ROI within a few weeks of implementing AnswerRocket. Check out SnapAV’s experience of finding a $1M opportunity within just a few minutes of reviewing their data. Or listen to how AnswerRocket delivered groundbreaking analytics to the game designers and marketers of Hi-Rez Studios. Gartner’s annual Data & Analytics Summit brings together all of the key players in this space, along with thousands of enterprise leaders looking for analytics solutions. We were honored that Gartner asked us to help kick off the Summit by giving a demonstration of AnswerRocket at their Innovative BI in Analytics session. Our smart data discovery solution clearly struck a nerve, as our booth was packed the rest of the Summit with people wanting to learn more. I give demos of AnswerRocket every week, and I regularly get astonished reactions when people see our analytics tool for the first time. It seems too good to be true – until they see how quickly we can take their data and allow them to get answers and insights in seconds. Being named a Cool Vendor is certainly cool. But we’re not going to rest on our laurels. We remain even more committed to deliver innovative solutions designed to positively impact our customers and intrigue those seeking analytics solutions.